Apple has just announced their financial results for Q3 2012, with quarterly revenue of $35.0 billion and profit of $8.8 billion. The company sold 26 million iPhones and 17 million iPads in the quarter. The results missed analyst estimates by a wide margin and dropped Apple's stock price by 5%. 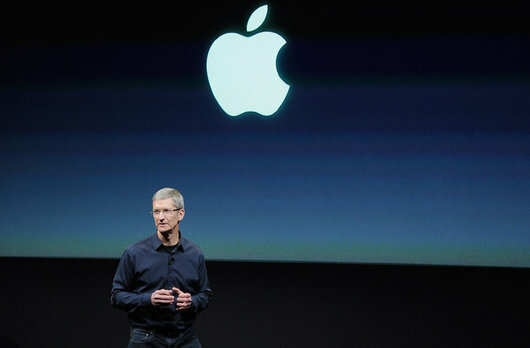 Apple's ultra-conservative forecast for Q4 2012 disappointed analysts & the market as well. Apple's iPhone sales dropped by about 9 million from the last quarter. This in itself isn't a major cause for worry as it was most likely caused by rumors of the upcoming iPhone launch next quarter. As we have seen before, sales normally slow down before the launch of a major product. However, it is interesting to note that this drop in iPhone sales had minimal overlap with the availability of the Galaxy S3. The true impact of the Galaxy S3 launch should be felt in the Jul-Sep Quarter (Q4 on Apple's financial calendar) and could be a reason for Apple's more-conservative-than-usual forecast. This could also be another reason for rumors of Apple moving up the launch date of the iPhone 5 & iPad Mini to September. Even though the iPhone sales drop in Q3 isn't cause for much concern, I did notice a few worrying signs in Apple's Q3 results. Let's take a look at these. 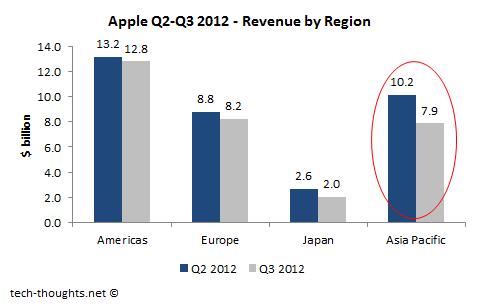 As a reminder, in the previous quarter in our fiscal Q2, we launched the iPhone 4S in China in January. We added China Telecom as a second carrier in March. And as we proceeded across the quarter, we increased the channel inventory to accommodate the sales and to reach our target inventory of four to six weeks. The remainder of the sequential revenue decline is mainly attributable to normal seasonality after the very successful iPhone 4S launch. We did not see an obvious impact in Q3 that we would associate with the economy in mainland China. So, according to Tim Cook, the build-up in channel inventory following last quarter's iPhone 4S launch led to lower channel sales in Q3. This means that the huge jump in Q2 iPhone sales was attributable to the channel inventory build-up, as opposed to sales to end consumers. This is similar to what happened to the Kindle Fire in Q1 of 2012. The only conclusion this gives us is that Apple's performance is China isn't as great as the Q2 results made them out to be and seem consistent with reports of the iPhone's market share in China. Despite the 26% sequential in iPhone sales from Q2, Apple reported a healthy 44% increase in iPad sales. The launch of the new iPad drove up unit volume to more than 17 million in Q3. But sales volume doesn't tell us the entire story. 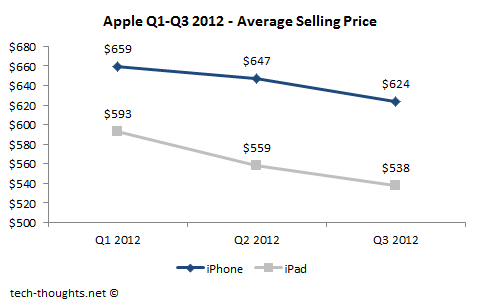 Let's take a look at the average sales price of the iPhone and iPad in the last three quarters. Now, dropping ASPs make sense for most smartphone and tablet manufacturers as prices are continually adjusted to account for new product releases. But Apple is a special case here since they only launch one product a year and pricing is constant until the new product is launched. Therefore, the only explanation for dropping ASPs is that more and more consumers are buying older products, once the price is cut, or lower storage products that give Apple smaller margins. Since the iPhone 4S was launched in Q1, along with the lower priced iPhone 4, the drop in ASP is understandable. The bigger concern here is that even the launch of the new retina equipped iPad in the last quarter did not boost the iPad's ASP. This could only have been caused by significant cannibalization of new iPad sales by the $399 iPad 2. Based on this data, Apple can expect the new iPad Mini to cause even greater cannibalization of existing iPad models. Therefore, Apple would most likely need to limit iPad Mini storage options to 8GB only and price it at $299 in order to keep cannibalization of higher margin products at a more manageable level. This wouldn't be a great move from a market share perspective, but it would help Apple in maintaining its gross margins near current levels. Conclusion - While Apple's Q3 results show a huge drop in iPhone sales, this is just a seasonal variation and not a long-term impact. The iPhone's performance in China and the dropping ASPs of the iPhone and iPad are greater cause for concern going forward. The drop in iPad's ASP may even have repercussions on Apple's strategy for the iPad Mini. Regarding China.. Is there any seasonality in Chinese purchases? Like Diwali in India, was there any reason for high purchases in Q2? The drop in component prices may well be steeper, but during the same time frame they also released the new iPad (with higher component costs) which had lower gross margins than the old one. So the overall gross margins did take a hit (as the financials show). More importantly, there is no reason for the ASP to drop in a product release quarter (iPad), other than cannibalization by the lower priced iPad 2. In China, the only trigger for high iPhone sales was the launch of the iPhone 4S on Chinese telecom carriers. I mentioned that in the article and that was my concern. The iPhone 4S launch built up channel inventory, which led to lower channel sales this quarter. But an inventory build also also means that consumer offtake in China was lower than what last quarter's results indicated.